I have to say, I love something a little sweet after my meal. Especially lunch. I feel it’s time to revive the “after lunch dessert” movement. Wait, is that actually a movement? Anyway, this was our after lunch dessert and let me just say, its lemony-goodness hit the spot. If I didn’t have to finish making lunch for my family, getting everyone a different drink, cleaning up spilled milk and washing the dishes…I could have taken a picture right away and you would have seen that this dessert comes out of the oven all puffed up and beautiful. If you serve them right away, they will look that way. My food blog fantasy is to have a team of people ready to take pics as soon as things emerge from the oven….prolly’ not gonna happen. This sweet little dessert (that by the way is low-cal), has a delicate sauce on the bottom….a nice little surprise. It’s perfection. Make it soon, you will love it too. Baking the cakes in a water bath creates an even, gentle cooking environment which lends itself to a moist, silky texture. All you need is six-ounce ramekins to make it all happen! Butter eight (6-ounce) ramekins. Set them in a shallow baking pan. In a medium bowl, combine flour, baking powder and salt. In a large bowl, whisk together egg yolks with 1/2 cup granulated sugar until pale and smooth. Whisk in butter, lemon zest and juice, milk and flour mixture. In a large bowl, using an electric mixer, beat egg whites with 1/4 cup granulated sugar until stiff peaks form, 5 minutes; fold into batter. With a ladle, divide batter among ramekins (keeping sides clean). Pour enough hot water into baking pan to come halfway up sides of ramekins. Bake until cakes are puffed and slightly golden on top, 30 minutes. Dust with confectioners' sugar and serve immediately. You have no clue how long I’ve wanted to make lemon pudding cake. You just put me over the edge! 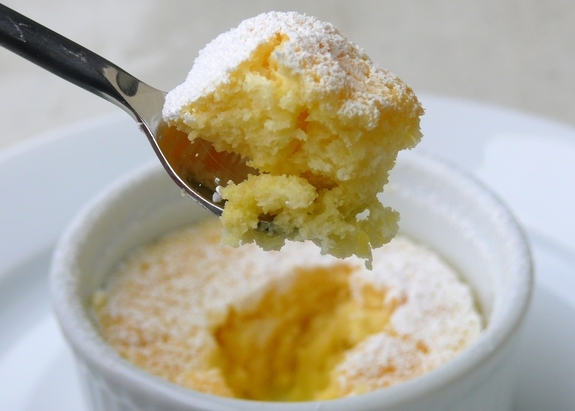 I had a recipe for lemon pudding cake from Sunset Magazine, I believe, years ago and lost it. Glad to be able to try this. The other recipe has a raspberry sauce, so I may add that. Thank you! These are yummy looking little delights! I am definitely keeping these in mind! My Grandma in Davis used to make this for me all the time using lemons from the Meyer lemon tree in her back yard. I need to try this! These look delicious and I canâ€™t wait to try them! 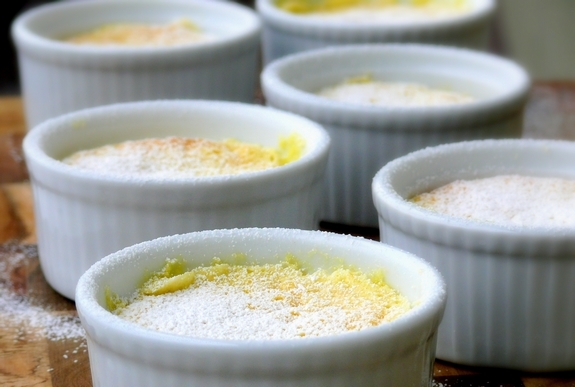 Lemon desserts are my absolute favorite! Love the look of this little cake. I just made these and it seems like it’s souffle-like? Not that i’m complaining or anything.. 🙂 it was DELICIOUS!!! I even forgot to add the milk and it was still yummy. I think the milk would have balanced out the lemon and made the cake even smoother, but it was delicious nonetheless. I cannot wait to try these. I love Everyday Food and I love lemon! Wow, these look amazing! I just got a pile of Meyer lemons from a co-worker so I will try them out on these. Thanks! I love pudding cakes. I first made one back in the 70’s called devils float and since then have made a cinnamon apple and also the lemon. Your’s look beautiful. Could I use skim mild instead of whole fat? Yeah, I have these on my list to make after reading the article. Now I KNOW they’ll be delicious! OMG I am so bummed that I missed this on the day you made them for lunch. I would have flown right out. Now I must make them for myself! Oh well….Cheers! Does anyone know how many calories are in these puddings?